September 21,2014—-Port Arthur, Texas, is a city on the gulf coast with a population of 57,755, and is home to four major oil refineries, four chemical plants, one petroleum coke plant, and an international chemical waste incineration facility. Shell and Valero have oil refineries on approximately 8,000 acres around Port Arthur, handling more than 900,000 barrels of crude oil per day. 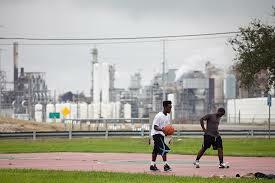 This is life across the street for residents of Port Arthur. What’s in the air around Port Arthur as a result of of the refineries and chemical plants? Toxic chemicals which effect the health of the people of Port Arthur, with a huge impact on the low income people nearest the refineries! The town has a 26% poverty rate, much higher than the rest of Texas, with much of this sector residing across the road from the refineries. The EPA places Port Arthur at the top in the nation for chemicals being released into the air, chemicals known to cause cancer, birth defects and reproductive disorders. The Texas Cancer Registry states that cancer around Port Arthur, near the refineries, is 15% higher than the average rate in Texas. A study by the University of Texas found those living close to the refineries reported a four times greater than average incidence of heart and respiratory conditions, skin and nerve disorders, headaches and ear, nose and throat problems. 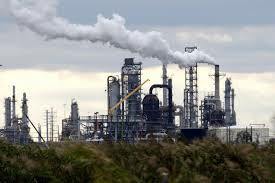 Troynell Daw of Port Arthur stated, “I grew up on the west side next to the refineries. In 2003, my 17 year old sister died of a brain tumor. Six years later, Mother died of breast cancer and 6 months later Grandmother died of stomach cancer.” It’s the same story for many of the families near the refineries. On May 15, 2014, the EPA proposed new regulations for cancer-causing toxins being released into the air by oil refineries. This proposal would require refineries to measure the toxins in the air, as they enter the communities, from their fence lines. The proposal would also remove unlawful loopholes in the existing standards, so the refineries can “no longer get away with violations that occur during startup, shutdown, and malfunction periods.” Luke Metzger, director of Environmental Texas states that emissions are far greater than what is reported from the refineries, “Refineries generally only report emissions from leaks and other upset conditions from the time they are discovered, which may be long after they begin.” These proposed regulations are still in debate, with many environmental groups stating the proposals still don’t require enough. Russel Honore, founder of the Green Army, a coalition of environmental groups and concerned citizens fighting against pollution, states, ” The objectives of big oil are not to care about the health of the citizens near their refineries, but only to avoid liability.” He’s asking people to make comments on the EPA’s new proposal for refinery emissions. “If people don’t comment, the lobbyists will convince legislators that the new rules are not needed.” The EPA has until April 2015 to finalize the ruling. Categories: Fossil Fuels, Pollution, Population, Poverty | Permalink.